President Morehead and Georgia officials learn firsthand about state’s No. 1 industry. University of Georgia President Jere W. Morehead traveled to South Georgia Sept. 25 to learn more about Georgia’s top industry—agriculture—during his annual Farm Tour. 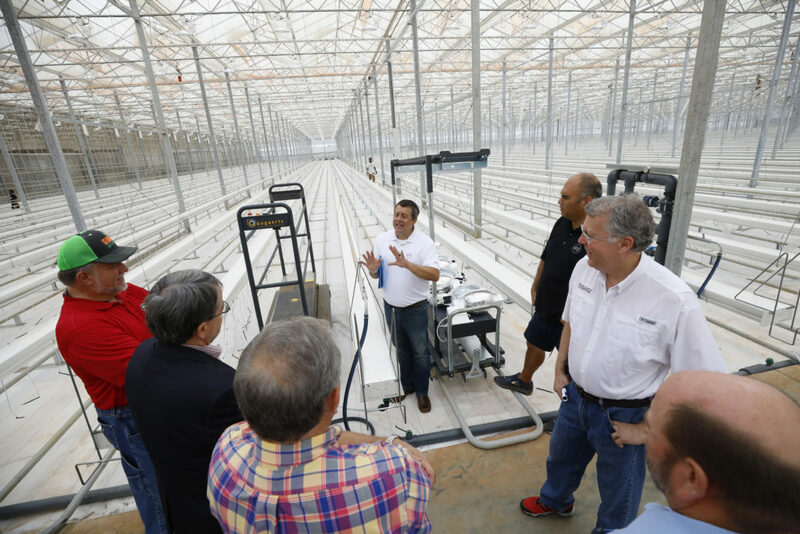 The tour’s stops highlighted the diversity of the agriculture industry, ranging from the Pure Flavor Greenhouse Complex in Fort Valley to Premium Peanut in Douglas. The 2018 Farm Tour marked the sixth year that Morehead, joined by Georgia Commissioner of Agriculture Gary Black and members of the Georgia General Assembly, visited farms and connected with the state’s agriculture industry leaders. Each year, the Farm Tour visits a different region of the state to understand the range of challenges and opportunities facing Georgia’s farmers. The annual event provides a critical opportunity to connect the state’s land- and sea-grant institution to Georgia’s communities, businesses and leaders. Sam Pardue, dean and director of the UGA College of Agricultural and Environmental Sciences, accompanied Morehead and Black on the tour along with state Reps. Terry England and Tom McCall. This year’s tour started at Pure Flavor Greenhouse Complex in Fort Valley. The company opened a location in the state in 2017 and produces tomatoes and cucumbers year-round in a 75-acre greenhouse complex. The produce grown by Pure Flavor is part of the $1.1 billion value of Georgia’s vegetable crops. The Farm Tour also traveled to Pecan Ridge Plantation in Bainbridge. The business is operated by two UGA graduates, Rob (BSA ’96) and Eric Cohen (BSA ’00), and spans five counties throughout South Georgia and North Florida. This stop featured a pecan orchard in Decatur County, part of the Cohen brothers’ 1,400-acre pecan operation. Eric Cohen also showed off his dog, Tate, who is trained in locating truffles in pecan orchards, a gourmet delicacy that is highly desired by restaurants and chefs. Reflecting on his business, Cohen credited UGA Extension pecan specialist Lenny Wells and plant pathologist Tim Brenneman for the success the Cohen family has enjoyed in producing pecans. Georgia is the country’s largest producer of pecans, with a farm gate value of $355.8 million in 2016. 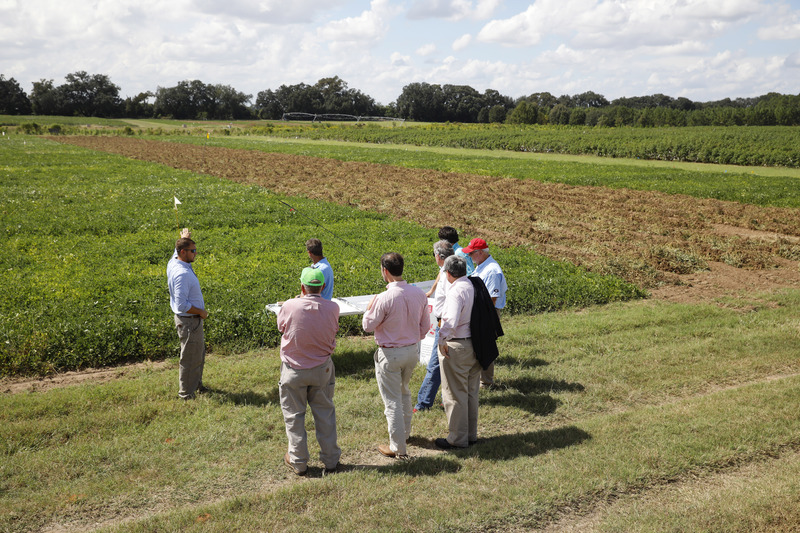 Irrigation research is vital to improving state crops like cotton, peanuts and vegetables. The Farm Tour visited UGA Stripling Irrigation Research Park in Camilla, Georgia, to see how water factors into the development of crops over the course of the growing season. Calvin Perry, superintendent of SIRP, highlighted irrigation scheduling work by UGA College of Agricultural and Environmental Sciences precision ag specialists Wes Porter and George Vellidis. “What is unique about the research here is it’s often very practical and can be transferred to our growers very easily and quickly. I think that’s what we tried to key in on. This isn’t back-in-the-lab research that takes 20 years to reach a grower; what we do is provide information that can go directly to growers immediately,” Perry said. The tour’s final stop was at Premium Peanut, the largest single shelling facility in the world. Premium Peanut was founded in 2014, when seven buying points in Georgia came together to form the business.